When Lime House first opened its doors in 2013, they introduced the Caribbean concept of “liming”, which means the art of sharing food, drinks, conversation, and laughter. The restaurant and bar is set in a heritage four-storey shop house in Chinatown’s Keong Siak belt. The owner of Lime House, Chris Morris wanted his customers to view Lime House as an extension of their own homes. This is clearly reflected in the interior and décor of the space, as well as the warm and welcoming staff that instantly made us feel at home! The space gives out laid-back, vacation vibes which complements the home-y taste of the dishes served. After celebrating 5 fantastic years of Limin’, Lime House launched their new Caribbean Tapas and Cocktail menu which features some of their old favourites as well some new delectable selections. One thing is for sure, by the end of the night, we were so stuffed that we could roll out of the door! Lime House prides themselves in their house-made sauces and curries that are all made from scratch. As a result, one of the stars of their menu is the Jerk Chicken Skewers which features their homemade sauce and delectable pineapple salsa. Their chicken was tender and had a good balance of flavours. Another interesting menu item was the Seafood Tostones. The tostones are double fried plantain, whilst the seafood cocktail dip is a concoction of prawn and squid in a Rum-infused, spiced dip. This dish had a bit of a throaty spice and was and interesting melding of flavours. The Caribbean Rice Bowls consists of brown rice topped with Oxtail, Tribajam Curry Goat, Jerk Chicken, or if you are vegan, Ital Stew. Our favourite was the Tribajam Curry Goat Rice Bowl! The mutton was very tender and had a familiar, home-y taste to it. I would definitely order this the next time I visit! They also launched a few new cocktails such as Rebel Stormy – A concoction of homemade Falernum, ginger beer and passionfruit, Jamaican Sunset – Pimms N1-based drink with fruit, spices and ginger beer, and Bison Cooler – Vodka flavoured by Bison Grass, with the refreshing flavours of chamomile essence and apple juice. The Bison Cooler was definitely my personal favourite! It’s very refreshing and, in my opinion, great to cleanse the palette! Recently, my mum was in hospital for 3 weeks. Having to visit her in the hospital almost every day caused me to stop cooking for the family. Eating out all the time was very daunting for my family and I, so since it was a weekend night and I was not visiting mum, I thought it will be great to whip up at least one or two homecooked dishes for my family. 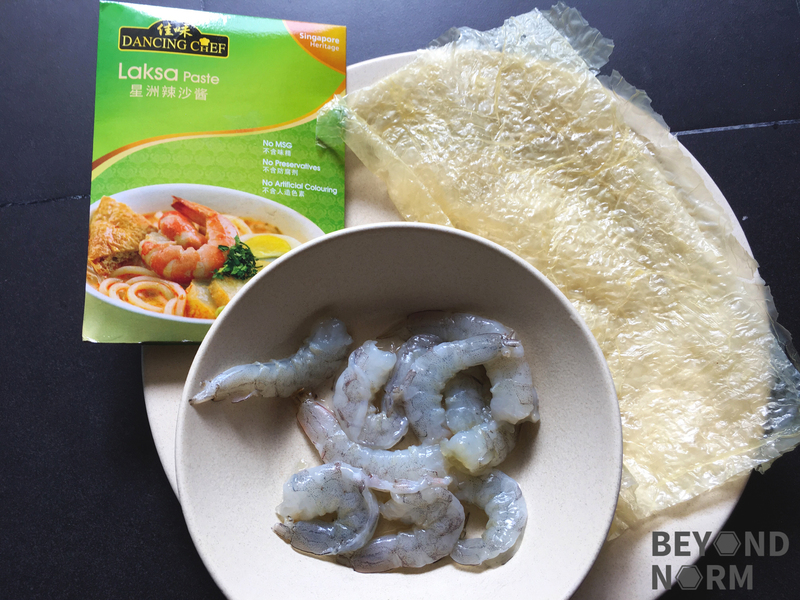 I was delighted that once again that I was able to create this quick and easy Laksa Prawn Pancake for the family using Dancing Chef’s Laksa Paste. The laksa paste indeed added a twist to the normal prawn pancake that I usually cook. It added an extra oomph to the pancake!! If you like this you might also want to try our “Din Tai Fung” Style Prawn Pancake (脆皮虾饼). 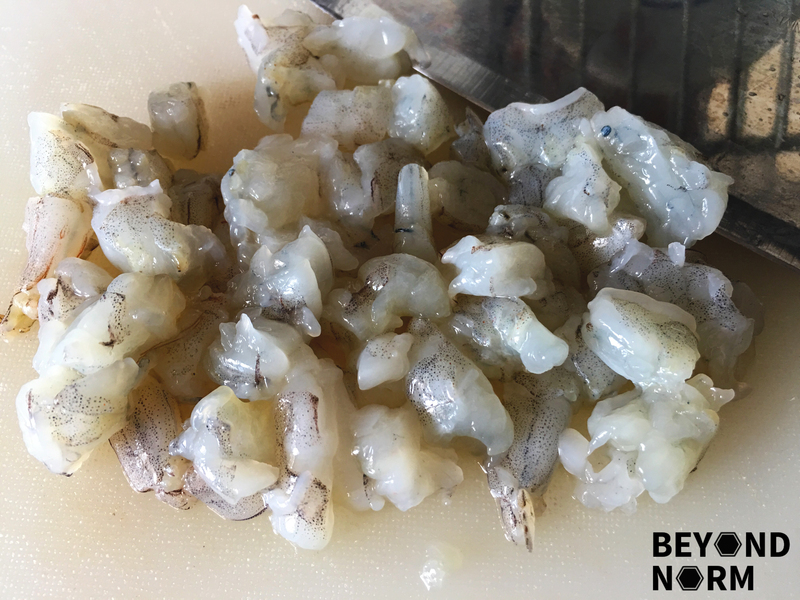 Remove shell from the prawns and devein them. Smash the prawns on the chopping board and then mince them. Add in the laksa paste and marinate it for 30 minutes. 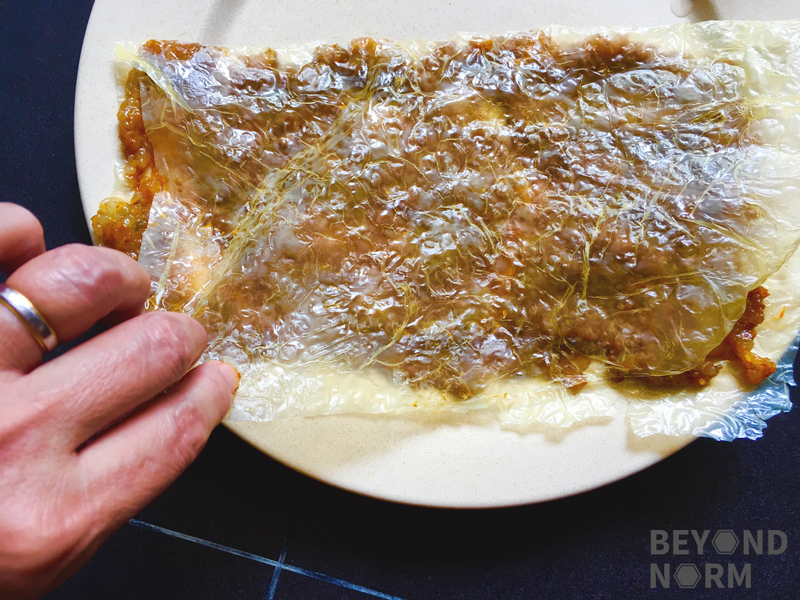 Gently wipe the bean curd skin on both sides with a clean, damp cloth; this is to get rid of the salt coating. Cut 1 or 2 pieces of the dry bean curd sheet into 6 inches x 4 inches or you can cut it according to your desired size. 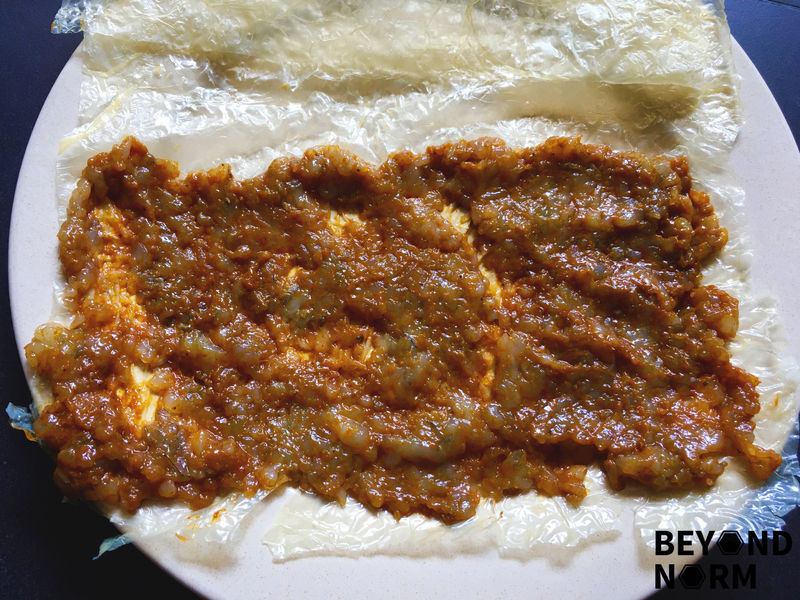 Spread the prawn laksa paste on half the piece of cut bean curd sheet. Next fold the bean curd sheet in half and set aside. Repeat till the paste is used up. Heat up some oil in a non-stick pan, on medium-low heat. Pan fry on one side till golden brown. Flip the pancake over to pan fry the other side till golden brown or prawn paste is completely cooked. Dish out and cut into smaller pieces. Serve immediately with steamed rice. 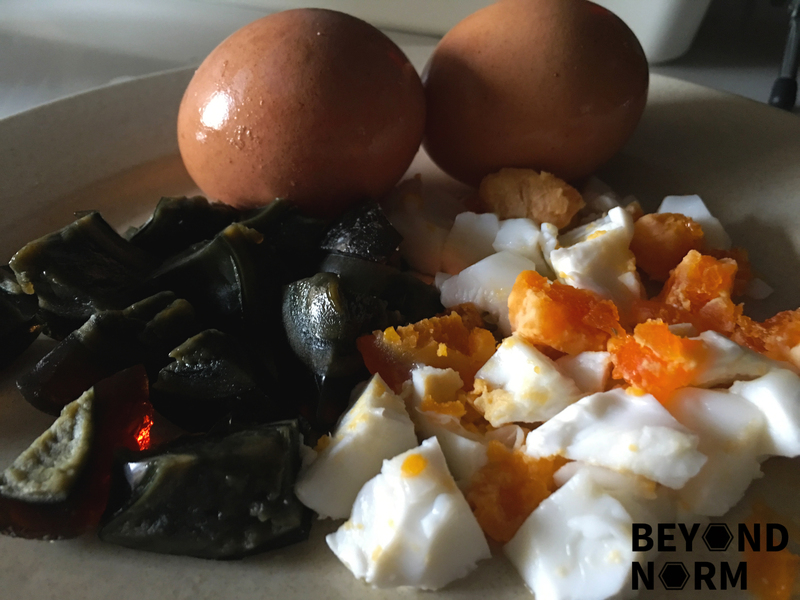 Trio Eggs Spinach in Superior Broth is a dish which is so simple and inexpensive to whip up at home. 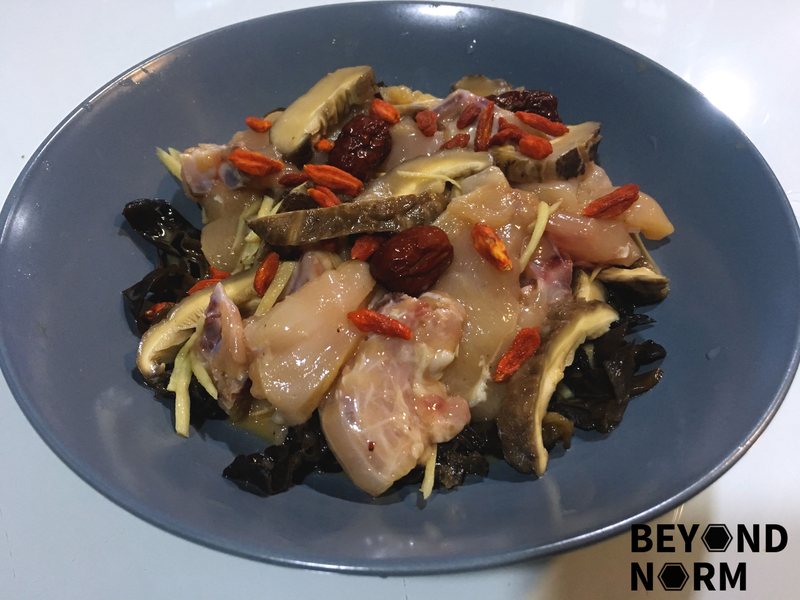 In a restaurant, you will most like pay about S$18.00++ for the dish, whereas at home you will pay much lesser for the ingredients and get a more nutritional dish that is free from artificial flavourings and MSG. 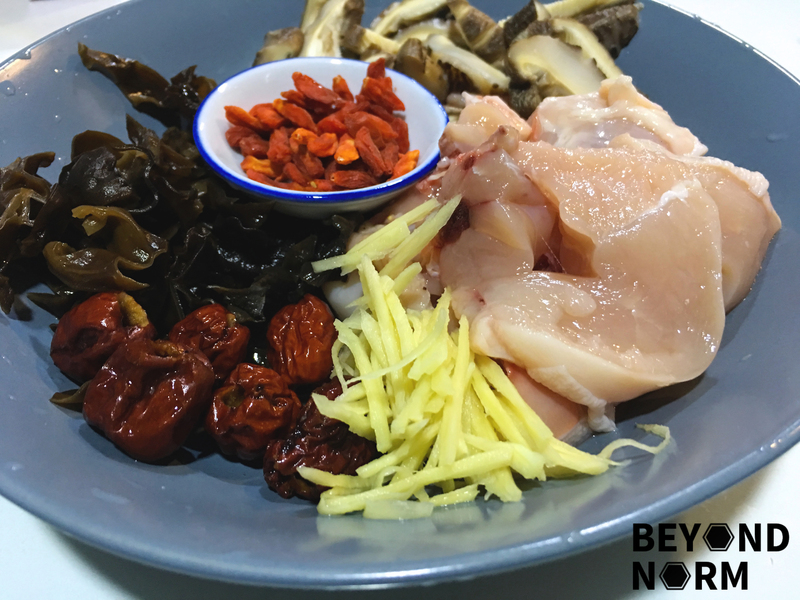 My humble superior broth is made from pork bones, chicken bones, and chicken feet. I brought it to a boil and then lowered the heat and simmered it for at least 3 hours. 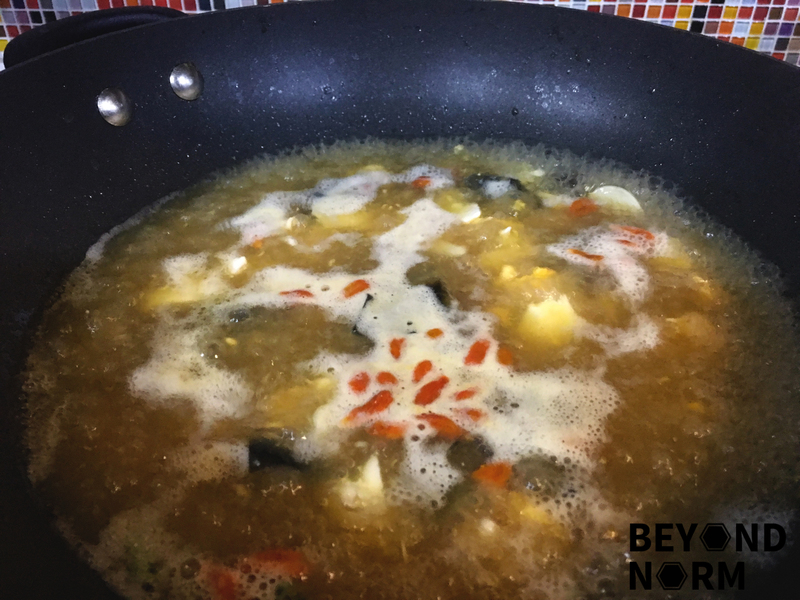 I usually prepare a pot of such stock to keep on hand so that I can use them whenever I am doing a quick-fry, stir-fry, braised, or steamed dish. The flavour of all these dishes are enhanced by adding a splash of homemade stock. Note: In our video, you can see that I blanched the spinach (see note below) but in this recipe I lightly stir-fried the spinach. Boil the salted egg for 6 to 7 minutes. Remove the cooked salted egg from heat and let it cool. Peel and cut the egg into bite-size pieces. Set aside. Peel and slice century egg into bite-size pieces, then set aside. Beat the 2 farmed eggs, then set aside. In a pan, heat up the cooking oil and add in the garlic. Fry till it is fragrant then add in the spinach. Fry till it is almost cooked. Remove and set aside. Using the same pan, add in the stock and bring it to boil. 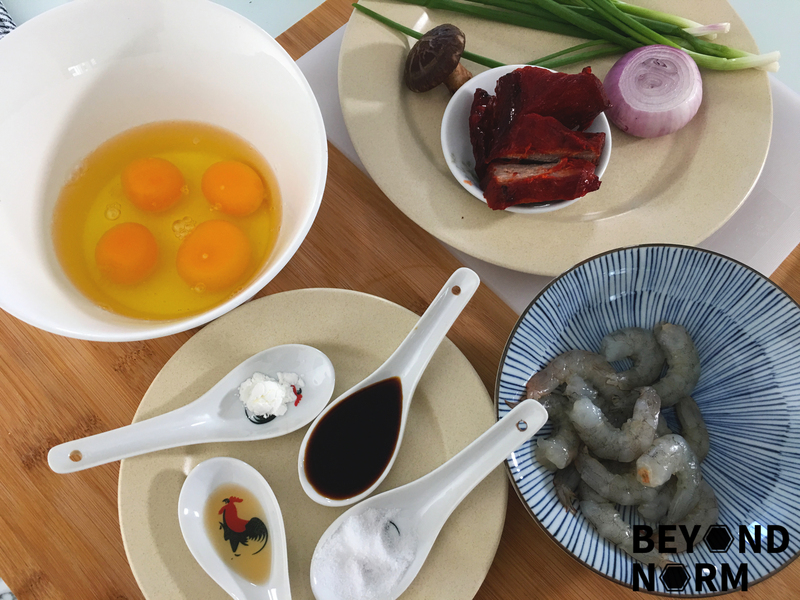 Add in the salted egg, the century egg, and wolfberries. Add in the spinach and then stir in the beaten egg. Add in the cooking wine and let it simmer for 2 minutes. Add in a pinch of salt and a dash of white pepper for taste if necessary. Add some water into a pot and bring it to a boil. Add 1 tbsp of cooking oil and a pinch of salt to the water. 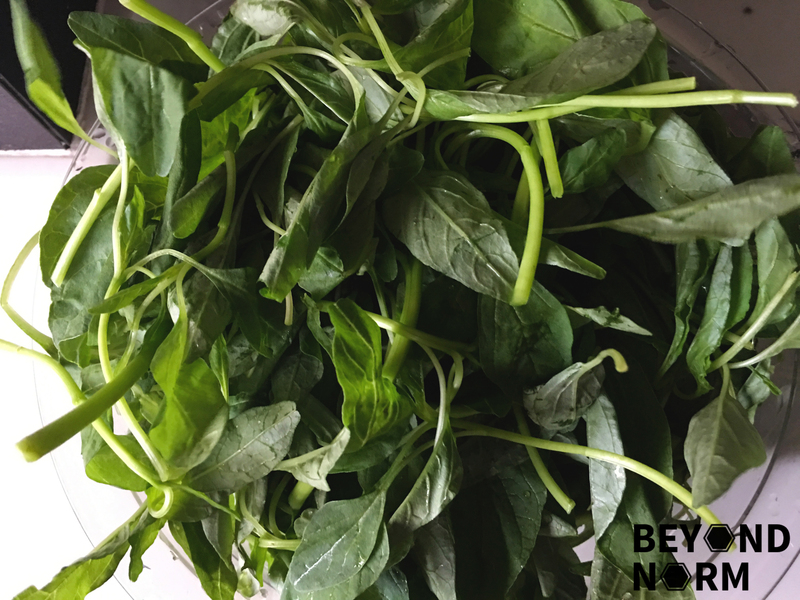 Blanch the spinach stems for 2 mins, followed by the leaves for 1 minute. For as far as I can remember, when we were staying in Kuala Lumpur, each time we ate at Chinese restaurants with my brother-in-law, he will order Egg Foo Yong. Up till today, I’ve always wondered why… But I guess it may be his favourite food. The ingredients for this dish is so versatile that you can add in ingredients of your choice. 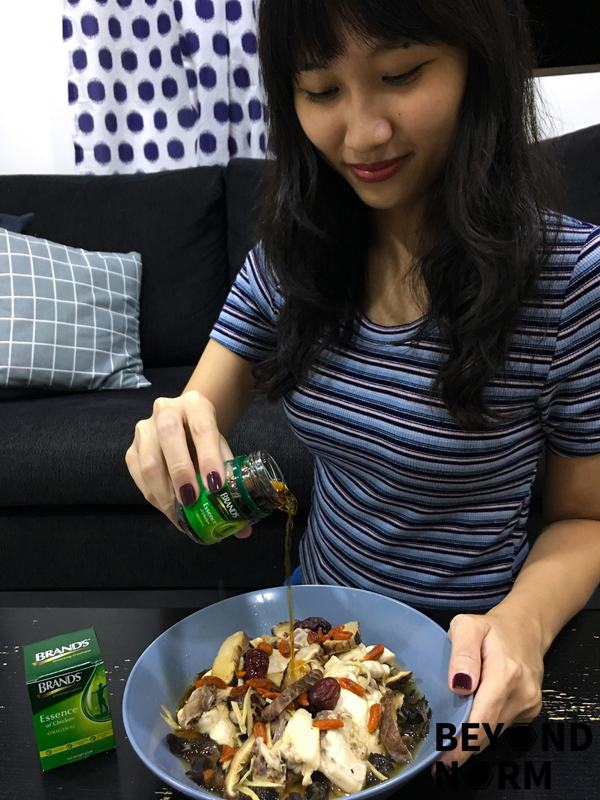 You can either make it into a vegetarian dish by omitting all the meat or you can add in as many of your favourite ingredients to make a nutritious and delicious dish. Lightly pan-fry the prawns. Remove and set aside. Add in the onions and the mushroom. Sauté them. Then remove and set aside. Add in the BBQ pork and warm it up. Remove and set aside. Whisk eggs and seasonings in a bowl. Add in the spring onions, mushrooms, prawns, BBQ pork, and red onions into the egg mixture. Combine well. Heat up the oil in the wok/pan. Fry on medium-low heat until the bottom starts browning and the eggs appears to be setting. Try to lift and flip the omelette over. Let it fry till it is browned evenly. Once it is done, transfer the omelette into a serving plate. Serve immediately. As a family, we love fish and every now and then you will see a fish dish on our dinner table. If you are like us, check out some of our other fish recipes on our website. I think steamed fish is the best way to savour the freshness, tenderness and silky texture of the fish. This Steamed Herbal Fish is no exception. Moreover, it is enhanced by the herbal gravy and with almost 0% fat in this dish!! Those who are watching their waistline will welcome this dish. Hahaha. 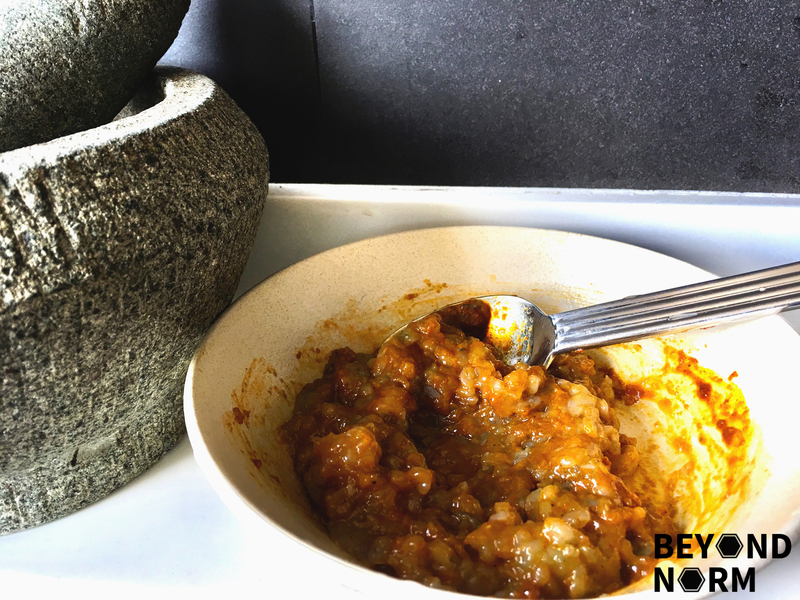 Hence, I would classify this dish as a healthy dish, as the herbal infused gravy helps to replenish the nutrients to our bodies without compromising on the taste. Wait no more and let’s start eating healthier! Let us know what you think about this recipe and give us some feedback on what you would like to see next. We would also like to welcome you to join our Mummy’s Kitchen Facebook Group for food lovers like you, whether newbie or veteran. You can like and follow us on Beyond Norm’s Facebook Page and subscribe to our blog. Follow us on Instagram and YouTube, @beyondnormblog, to get the latest exciting updates and videos. On medium heat, combine the herbs and the homemade stock in a saucepan. Once it is boiling, turn it to low heat and let it simmer for about 10 minutes. Rinse the fish fillets then pat dry. Season the fish with some salt and pepper. Then place them in a flat-based bowl. Prepare a steamer and let the water boil. Pour the herbal sauce over the fish. Then steam on high heat for 8 to 10 minutes or till the fish is cooked through. Remove the fish from the steamer. 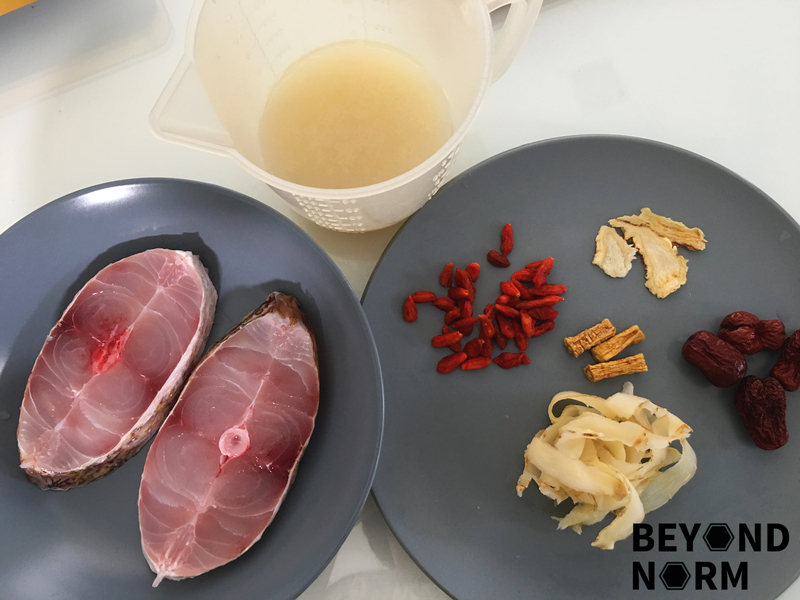 Drizzle with Shaoxing wine, and sprinkle some chopped spring onions and some wolfberries over the fish. Serve immediately.